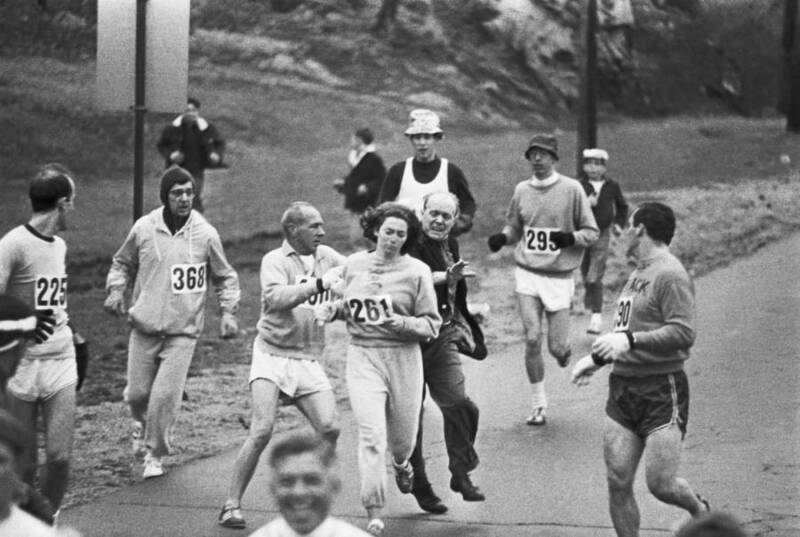 Kathrine Switzer made history in 1967 as the first women to register to run in the Boston Marathon. Born in Germany to an American Army family, she was an athletic and driven child. She attended Syracuse University, where she trained with the men’s cross country team and met her coach, Arnie Briggs, who agreed to support her Boston Marathon run after seeing her complete at 31-mile practice course. It was only a clerical error that allowed her to officially enter the race. She registered under only her initials, “K.V. Switzer,” and, as a result, race officials did not realize she was a woman, and let her sign up. She was officially registered for the marathon under the number 261. Despite entering in the race under legitimate circumstances, the race officials attempted to stop her. Even after realizing she entered due to their mistake, race officials attempted to prevent her from running the course. One race official, Jock Semple, even attempted to physically rip off her bib during the first few miles of the run. Previously, officials insisted that women were too “fragile” for a 26.2-mile race, and so they were banned from competing. 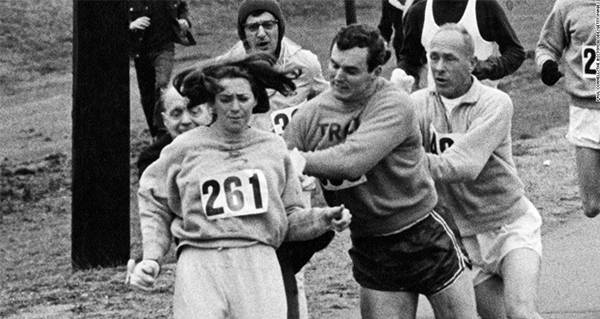 Kathrine Switzer cleanly proved them wrong, but the Amateur Athletic Union responded by banning all women from running events with male runners. Switzer and other female running advocates pushed for a change to the laws, but it wasn’t until 1970 that women were finally officially allowed to run the Boston Marathon. Switzer went on to found the women’s running club, 261 Fearless, named for her original bib number. The women’s running club was meant to empower and inspire women runners across the world. Switzer says that the club, and the response she’s received from fellow female runners, is empowering, for her and them. 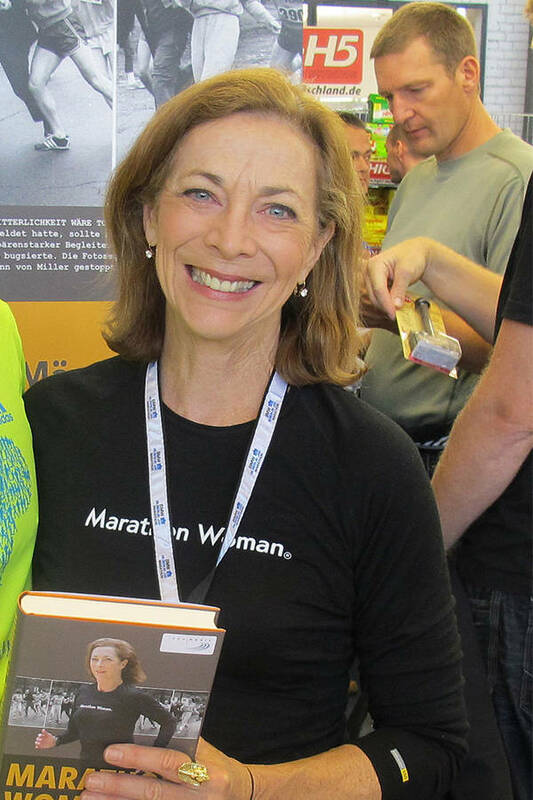 In 2011, Kathrine Switzer was inducted into the National Women’s Hall of Fame, for her undeniable contributions to the advancement of women’s equality and empowerment through running. In 2017, Switzer ran the Boston Marathon and was assigned number 261, registered under her full name this time, to commemorate the 50th anniversary of her historic run. After the race, the Boston Athletic Association said they would no longer assign the number, as it would forever honor the work of Kathrine Switzer. Next, check out another incredible woman, Violet Jessup, who survived not only the Titanic sinking, but the sinking of its two sister ships. Then, read about the Boston Molasses Disaster of 1919.